It is believed that approx 5 Lac users of Google+ data have been caught in private data developers due to the crack in security. In that situation most of Google Plus users are frightened due to leak of his secure data and want to delete them. In this guide we have to discuss how to delete Google Plus without deleting Gmail account. Google has announced to shut down the Google+ from his social network before a few days ago due to the security reason. According to the report, it is believed that 5,00,000 users of Google+ using personal data which have been caught by the private developers. As per company that it has added lot of better ways which helps you to secure your data. It may happen that you have created a Google Plus account and you have forgotten the password due to not using for a long time. Few users also logged into YouTube for watching the video, but forgot the password after sometime. In that situation you must have to keep safety for your data. 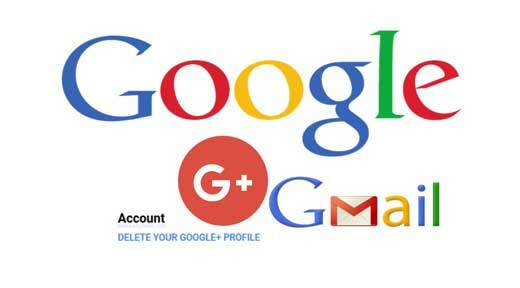 You can easily delete your Google Plus account without deleting your Gmail ID. After deleting all the data from Google Plus can’t be undone. So, before doing this steps, make sure you want to delete your Google Plus Profile data or not? If Yes, then you must have to read this article, allows you how to delete all the data and user account from Google Plus without deleting Gmail. Step 1: Open your register Gmail account in which your Google+ profile already activated. Click on the Google Profile icon, which is located at the top right corner of your active Gmail window. Step 2: In Google Account window, click on the Google Apps icon which is located at extreme left side of Notifications icon. Step 3: Now your control transfer into Google+ window. In Google+ window click on the “Settings” option which is placed above the “Send feedback”option. Step 4: Scroll down your active Google+ Settings window. At the bottom you can find “Delete Your Google+ Profile” option which is placed in “Account” category. You just click on this option. Google+ again ask you to fill your active Gmail account password from which you want to remove Google+ profile. After filling the correct password you have to turn on given both options. Also un-follow me from anyone I am following in other Google products. Required: Yes, I understand that deleting the Google+ profile. You can’t be undone and the data I delete can’t be restored. Now, click on the “Delete” button to finally remove your Google+ profile from your Gmail account. Choose any required option in the Google’s feedback window and click on the Submit button.